The major pathway into saliva for most steroid hormones and other small, neutral molecules is by passive diffusion. The salivary glands are surrounded by dense beds of capillaries, and many blood components pass easily through the capillary walls, bathing the saliva glands. The neutral steroids diffuse readily through the lipo-protein membranes of the secretory cells in the saliva glands and into the saliva. Studies have shown that the speed of entry is rapid, and that stimulation of saliva flow does not affect the concentrations of these neutral steroids in saliva. Serum proteins like albumin or corticosteroid binding globulin are too large to pass through the membranes of the salivary cells. Since 90-99% of the steroids in blood are bound by these specific or non-specific proteins, only the free, non-bound steroid molecules are able to pass into saliva. For this reason, salivary concentrations of steroids are much lower than those in blood. Blood components can find their way into saliva, however, through the serum-like gingival crevicular fluid, especially when periodontal disease is present, or through micro injuries in the mouth. Because of the much higher levels of steroids in blood, even the presence of very small amounts of blood contamination can falsely elevate steroid measurements in saliva. Electrically charged steroids such as dehydroepiandrosterone sulfate (DHEA-S) are not able to diffuse through the neutral lipid membranes of the salivary cells. 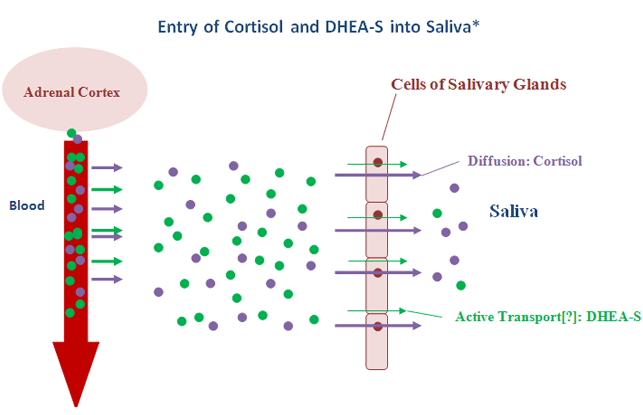 The mode of entry for DHEA-S into saliva is not clear. Formerly, it was thought that it enters saliva only by squeezing through the tight junctions between cells. It is too large to do this readily, however, which was thought to explain the very low percentage of DHEA-S that makes its way into saliva compared to the neutral steroids–typically around 0.1 % of serum levels in pure parotid saliva. More recent work has identified a large family of organic anion transport polypeptides (OATP) that actively transport molecules such as DHEA-S across membranes. It is now thought that such a mode of entry may exist for DHEA-S into the saliva glands as well. Due to the much higher levels of DHEA-S in blood compared to saliva, extra care must be taken to avoid blood contamination in the saliva. Saliva samples may be tested for blood with the Salimetrics Blood Contamination EIA kit, which checks for the presence of Transferrin, a large protein found in high concentrations in blood, but not in uncontaminated saliva. Because the mechanism of entry for charged steroids like DHEA-S appears to be rate-limiting, the migrating molecules are not able to keep up with increased saliva flow, and concentrations in saliva drop when stimulation occurs. Due to the variability of saliva flow from person to person, or even for one person at different times, expression of the assay results for DHEA-S without reference to the rate of flow of the saliva can make the data hard to interpret. Another analyte affected by saliva flow rate is the immunoglobulin SIgA. This protein is different from the steroids, since it is not derived from blood. Instead, polymeric IgA is secreted by B-lymphocytes in the vicinity of the salivary glands, and it is then actively transported through the cell membranes by a Polymeric Immunoglobulin Receptor and released into saliva as SIgA. It has been shown that secretion of SIgA is increased by nervous stimulation of the salivary glands, but like DHEA-S, there must be an upper limit to the speed of the transport, since concentrations of SIgA in saliva are known to decrease as flow rates increase. Another class of analytes found in saliva includes those that are synthesized directly in the secretory cells of the saliva glands. These are mostly proteins or peptides, including enzymes, mucins, cystatins, and histatins. These products are stored in granules within the secretory cells, and their release is controlled by nervous signals in the sympathetic and/or parasympathetic systems, which also control saliva flow rates. The enzyme α-amylase is currently receiving attention as a convenient, non-invasive measure of autonomic nervous activity. At least one paper has stated that changes in α-amylase concentrations in saliva in response to a stress test are independent of flow rates, but more recent studies have maintained that salivary concentrations of α-amylase are affected by changes in flow rates. Measure the length of time needed to collect the desired amount of saliva. Divide the volume by the time in minutes to get the flow rate (mL/min).